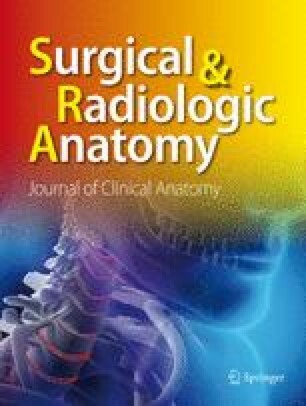 The aim of this study was to identify the anatomical variations in the inguinal course of the ilioinguinal nerve (IIN) and the iliohypogastric nerve (IHN) during operative repair of inguinal hernias. A consecutive series of 110 primary inguinal hernias were repaired by the mesh technique. Particular attention was paid to early identification and recording of the course of both the IIN and IHN and preserving them throughout the operative procedure. The course of both nerves was found to be consistent with that described in anatomical texts in only 46 of 110 explorations (41.8%). The course of one or both nerves was found to be a variant in the other 64 of 110 (58.2%) explorations and often rendered them susceptible to injury. These variations included: (1) acute infero-lateral angulation of the IIN at its exit behind the superficial inguinal ring (SIR) fibers in 20 of 64 cases; (2) similar direction of the IIN but in a plane superficial to the external oblique aponeurosis (EOA) and proximal to the SIR in 18 of 64 cases; (3) a single stem for both nerves over the spermatic cord in 24 of 64 cases, with variation in the subsequent course; (4) absence of one or both nerves in 8 of 64 cases; (5) accessory IIN or IHN in 3 of 64 cases; and (6) aberrant origin of the IIN from the genitofemoral nerve (GFN) in 2 of 64 cases. None of 68 of 105 patients seen at 3 months postoperatively (compliance rate 65%) complained of sensory disturbances or pain in a dermatome distribution of the IIN or IHN. It is concluded that anatomical variations in the inguinal course of the IIN and the IHN are extremely common but readily identifiable. Their early identification and preservation is likely to abolish, or considerably decrease, the incidence of postoperative sensory changes and/or neuralgia pain.